A depiction of private company Astrobotic's "Red Rover" on the moon. 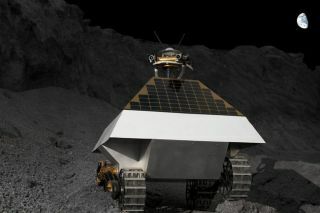 Astrobotic is one of the teams racing to land a private robot on the moon and win the Google Lunar X Prize. NASA has signed six contracts worth as much as $30 million inall to purchase data from private teams competing to send homemade robots tothe moon. The U.S. space agency awarded small, firm-fixed pricecontracts worth at least $10,000 to six teams competing in the GoogleLunar X Prize contest to design, build and launch private moon probes. But contracts could ultimate award as much as $10 millionfor lucky individual teams through sales of technical data, as the privatecompetitors race to develop vehicles and end-to-end robotic lunar landingmissions. The total maximum value of the contracts over five years could reachup to $30.1 million, NASA officials said. There is a catch. The Lunar X Prize teams must earn theirpaydays by offering the most valuable and unique data related to milestonedemonstrations of sending low-cost missions to the lunar surface. "The dollar values may be a relatively small contractby NASA standards, but these contracts send a clear signal to the investmentcommunity that NASA is ready to purchase lunar data, even from small,entrepreneurial firms," said William Pomerantz, senior director for space prizesat the X Prize Foundation. The NASA money comes in addition to the $30 million prizepurse up for grabs in the Google Lunar X Prize competition. Twenty-twoteams are racing to land a robot on the lunar surface, have it move atleast 1,650 feet (500 meters) and transmit data and images back to Earth. The first team to finish those tasks by Dec. 31, 2012, will claimthe $20 million grand prize. An additional $10 million is also available forsecond place and achievements such as finding water-icein lunar craters. TeamFREDNET, The Open Space Society, Inc., Huntsville, Ala. Teams may earn just over $1 million from NASA based oninitial data relating to tests on Earth, but most of the government funding isreserved for data coming from Lunar X Prize spacecraft en route to or alreadyon the moon. NASA's Innovative Lunar Demonstrations Data program ismanaged out of the Lunar Lander Project Office at the Johnson Space Center nearHouston.